Employers sometimes receive proofs that are incomplete or incorrect. To give Workers a chance to correct their mistakes, Employers are now capable of allowing Workers to revise their proofs during rating. In the comment box, enter your reason why you find the proof incorrect or incomplete (See blue arrow). Workers are given 48 hours to revise their task. Task will be marked NOK if the task is not revised and returned to Employer. Once task is submitted for revision, you will notice that in your campaign list, the Not Rated column changes from “—-” to the number of tasks for revision. 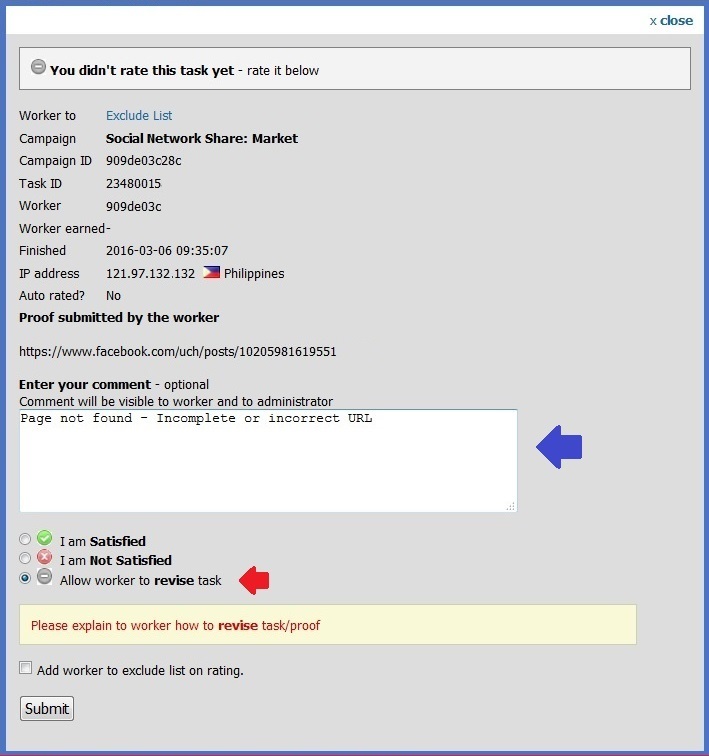 There will be no notification when Revised task has been returned to Employer. However, you can always click on the number under Not Rated column to check on the task. When a Revised task is received, you can finally rate it accordingly.